This 2019 ICD-10-PCS book includes the most current version of the ICD-10-PCS code set. Inlcudes thumb indexing, official ICD-10-PCS coding guidelines, and tables for code building. 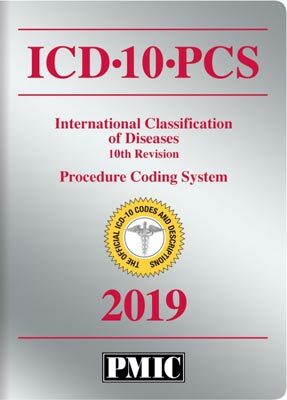 ICD-10-PCS 2019 code book edition. PMIC's ICD-10-PCS 2019 includes all official codes, descriptions, indexes and tables plus special features to help you code easier, better and faster.